Peanut butter and chocolate. A friendship of a lifetime. A combination unlike any other. You might have heard of buckeye balls, but they’re a pain to make with all the ball-rolling, and we’re trying to get peanut butter and chocolate into your mouth as quickly as possible. That’s why we’ve got this buckeye bark. This creamy peanut butter is sandwiched between semisweet chocolate layers to satisfy your craving without any manual labor. It only takes 30 minutes, so we hope you have your melted chocolate ready. Line a 9 x 13-inch pan with parchment paper and set aside until ready to use. Melt butter and add to a bowl of an electric stand mixer. Add in peanut butter and mix to combine. Slowly incorporate powdered sugar until everything is combined and you get a thick peanut butter mixture. It will remind you of really soft fudge and should hold together if rolled into a ball. Melt 1-1/2 pounds of chocolate and spread into the bottom of the parchment-lined pan. Let cool and harden and then press peanut butter butter mixture evenly on top of the chocolate. 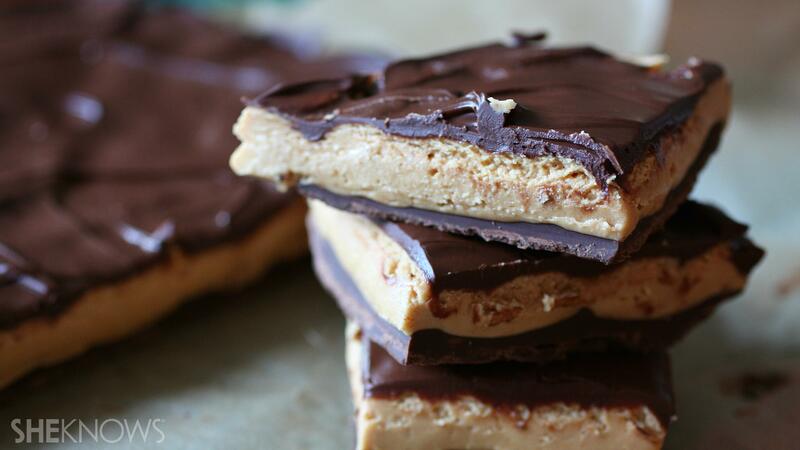 Melt remaining chocolate, spread onto peanut butter, let harden, then cut into squares and enjoy! Want more buckeye candy? Try these traditional buckeye balls.